With reports of defaults and foreclosures, some are predicting recession. But what would signal the beginning of a more severe prolonged downturn? As mentioned in May, every bank in New York in 1837 refused to pay gold and silver for its notes. Simply put, there was a run on the collateral. This ushered in the first depression for the U.S. In 1873, it was the failure of Jay Cooke and Co., one of the most respected and largest firms on Wall Street at the time, which sparked a series of bank runs. The period that followed is known as the Long Depression. In 1930, after the stock market crash, banks were forced to markdown their real estate loans, causing runs. Everyone knows that the Great Depression followed. What preceded each of these banking crises is even more telling: a credit boom that inflated stock market and/or real estate bubbles. And today? “What we are witnessing is essentially the breakdown of our modern day banking system, a complex of levered lending so hard to understand that Fed Chairman Ben Bernanke required a face-to-face refresher course from hedge fund managers in mid-August.” - PIMCO bond manager, Bill Gross, in his December Investment Outlook. During a boom, it has been said “A rising tide lifts all boats.” Warren Buffet added ‘Only when the tide goes out do you discover who's been swimming naked.’ The tide has ebbed. We are providing beach towels. Astute market participants have observed that ‘bull markets climb the wall of worry, while bear markets slide down the slope of hope.’ For instance, commentators worried about a real estate bubble as prices continuously rose. As prices peaked, ‘everyone’ agreed that there was a bubble. As prices fall, the common theme is: ‘Buy now! Hopefully, it’s the bottom.’ But as one of our readers recently commented; there aren’t any buyers at bottoms. Until the ‘Recovery Team,’ throws in the towel, don’t expect a lasting rebound. 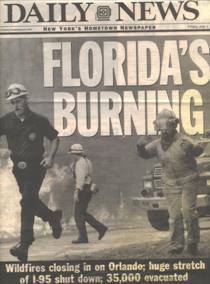 In 1998, Florida wildfires burned more than 100,000 acres in 39 counties. ‘Concerned’ authorities had restricted prescribed burning by Florida landowners. The resulting build-up of underbrush caused the eventual fire to be a conflagration. The attempt to control nature created a worse situation. Now imagine our financial system as that forest. Over the last 25 years, we have experienced recessions that burned shrubby speculators. While they seem painful at the time, these fires strengthen those that survived. But even the sturdiest trees do not live forever. As it becomes more apparent that the next fire will destroy much of the aging forest, ‘concerned’ authorities will attempt to control the financial landscape. Just as in 1998, eventually a lightning strike will occur and nature will prevail. We have to remember this is just nature’s way of renewing the forest. Investors must examine their institution, as the build-up of underbrush suggests what is coming is a conflagration. Is your custodian rotting with debt? Investing is holding something that someone else will pay you more for in the future. Price increases are the result of an increase in demand. Unfortunately, U.S. Treasury Bill (cash) holders are not rewarded for price appreciation. In fact returns (yields) fall as more people rush in. Bloomberg reported this August: “Three-month yields dropped the most since the stock market crash of 1987 and more than in the wake of the Sept. 11, 2001, terror attacks in the U.S, as funds shunned assets that may be linked to a weakening mortgage market.” As the environment changes we hope to find other assets that will have large increases in demand that will be more rewarding for investors. Until then, we will maintain our highly liquid position. We appreciate your patience. This in our view is the most important point we can make to investors. The U.S. Treasury makes the money. All other entities can default because they lack cash to pay off their debts. But the Federal government can always print money. Can it print too much money and cause inflation? Currently, the answer is no. It will be hoarded by whoever receives it. This is what occurred in the ‘30s. We expect it will happen again. Copyright ©2007 Lamont Trading Advisors, Inc. Paul J. Lamont is President of Lamont Trading Advisors, Inc., a registered investment advisor in the State of Alabama. Persons in states outside of Alabama should be aware that we are relying on de minimis contact rules within their respective home state. For more information about our firm visit www.LTAdvisors.net, or to receive a copy of our disclosure form ADV, please email us at advrequest@ltadvisors.net, or call (256) 850-4161.